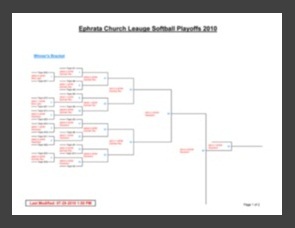 Welcome to our Church Softball League Website! It is our hope that this website will prove to be useful and convenient to whoever this information pertains to. Please feel free to explore all the links on this website and come back often to see what's new. Also, a big thank-you to Harvest Fellowship for giving us the web space and bandwidth from their website to host this site for the whole league! Last but not least, Thank-you Brian Weaver for keeping this information up-to-date and current for all of us! PLEASE NOTE: Brian cannot keep the scores and standings up-to-date without the coaches sending the scores from the previous night to Brian's e-mail. Please try to keep that in mind for all the players who check this site often. Thanks! New Team Sponsors For 2012!!! We specially want to thank Al's Service Center in Denver for their very generous support of our league this year. Follow the above link to LIKE them on Facebook! See maps and get directions to each of our playing fields and NOW there is a link to see a "Bird's Eye View" aerial photo from Microsoft Virtual Earth! This website is provided as a convenience to the coaches and softball players and due to unforeseen circumstances, the data on here could be incorrect. Please see your coach concerning any discrepencies or conflicts with dates, times, locations, scores or stats. We will make every effort to keep this valuable data up to date and current for your convenience. Thank-you for your cooperation!